This has two implications: (1) the consumer launch and -availability will be later this year, and (2) Microsoft Visio 2010 and Microsoft Project 2010 are launched as well today, in addition to Microsoft Office 2010 and SharePoint 2010. Due to my background in business administration these are both applications I use often, and I’m happy to see that with the 2010 release of Microsoft Office, -SharePoint, -Visio and -Project, the ribbon is available troughout the Microsoft Office Suite. Windows Phone 7, Windows Mobile 6.5 and … Symbian S60, MeeGo ? With the announcement of Microsoft Office 2010 + SharePoint 2010 the technology component is refreshed within the framework (that however has underlying relations with the other components). If you have watched the keynote you will hear Wolfje van Dijk, Strategist of KPN /Getronics refer to this framework as well. The introduction to Microsoft Office 2010 and SharePoint 2010 furthermore addresses the underlying reasoning and background information on devlivering the best productivity suite available on the market. These items are also part of the keynote below, and you will furthermore see some the productivity improvements demo-ed ! The second part of the launch-event was following live the Microsoft 2010 and SharePoint 2010 launch keynote with Stephen Elop, President, Microsoft Business Division. Very nice to see Wolfje van Dijk, Strategist of the Dutch company KPN/Getronics kicking of the Microsoft Office 2010 and SharePoint 2010 product launch by telling the story of KPN/Getronics. Steve Ballmer explained the Microsoft Ecosystem, the vision of Microsoft and The New Efficiency, during the keynote at TechNet_Live in the Netherlands last year, when Microsoft Windows 7, Windows Server 2008 R2 and Microsoft Exchange Server 2010 were announced! In the introductary story of Wolfje van Dijk, Strategist of KPN / Getronics, you could hear that the new efficiency reasoning underlies their decision to roll out Microsoft Office 2010, Microsoft SharePoint 2010 and Microsoft Exchange Server 2010. As part of the Microsoft Office 2010 beta programs you could sent feedback to Microsoft about improvements you wanted to see in their software. With 8.6 milion people already using Microsoft Office 2010 products you have a nice pool to user crowdsourcing techniques to improve your products. The payback period of about 7 months is impressive in the current competitive landscape. I wonder however if this the optimum result or the average result of a few case studies. The latter approach would provide a more realistic result in my honest opinion. In this context I would furthermore like to recommend the Mary-Jo Foley article “Forrester: Google still a distant Office competitor” on the All About Microsoft ZDNet Blog, that provides some additional Forrester consulting insights and compares Google Docs and Microsoft Office. 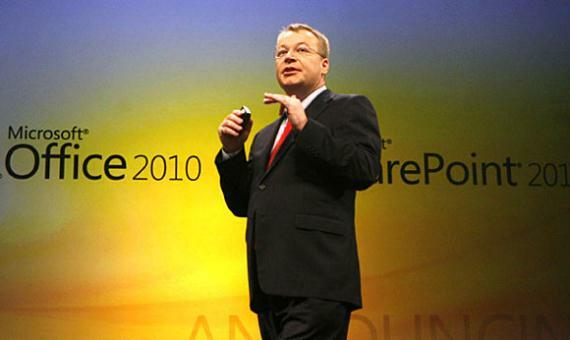 Stephen Elop, President of Microsoft Business Division, discusses the stories of a few close partners from all over the world, who already implemented Microsoft Office 2010 and SharePoint 2010 in their enterprises. I think this is a great approach to share real life practical stories, as a significant part of a product launch keynote. Especially since Microsoft Office is one of the company’s bestselling products. Very cool to see a great role of a Dutch company KPN/Getronics in here. Chris Caposella, Sr. Vice President, Microsoft Business Division, provides an excellent 20 minute demo that shows some of the new features and capabilities of Microsoft Office 2010, across the three-screens-and-the-cloud. Powerpivot in Excel 2010, facilitates easy sorting and filtering of huge datasets in mermory, that give instant results ! While I used the Microsoft Office 2010 Professional Plus-, Microsoft Visio 2010- and Microsoft Project 2010 beta on my desktop and reviewed the Microsoft Office Mobile 2010 beta application for Windows Mobile 6.5 there are quite some features that I haven’t used yet. The demo-ed new features in Microsoft Excel 2010 like the Sparklines, Powerpivot and Slicers are simply brilliant improvements. I’m looking forward to the final version Microsoft Office 2010 Webapps as well, in addition to the recently announced Microsoft Docs for Facebook. It is not a big surprise that Microsoft Office is one of the best selling products in the Microsoft product portfolio. Microsoft has pushed a lot of new productivity and efficiency features into the new product design of Microsoft Office 2010, SharePoint 2010, Microsoft Visio 2010 and Microsoft Project 2010. Furthermore you can see the awesome results of the three-screens-and-a-cloud-strategy that directs Microsoft, specifically taylored to the Microsoft Office productivity- and efficiency scenario’s. I think these quotes clearly show the commitment and strategic goals of the Microsoft Business Division. I personally like the consistent user interface across the three-screens, for example with the introduction of the ribbon in Microsoft Visio 2010 and Microsoft Project 2010. As a Windows Phone enthusiast I’m really looking forward to experience the Microsoft Office 2010 Mobile applications in the Office Hub on Windows Phone 7. I have already updated my Windows Phones (HTC HD2 and HTC Snap) to the Microsoft Office Mobile 2010 applications, that really foster huge improvements over the past mobile versions. Who of you remembers “Microsoft and Nokia form Global Alliance for Mobile Productivity Solutions” last year. I’m really curious to ind out if some of the Microsoft Office 2010 goodness will find its way on Nokia devices as well (in addition to Windows Phone). Nokia still ships an impressive ammount of phones, so I personally would expect such a strategic move within the Microsoft Office 2010 context, however this is pure speculation from my side. I haven’t taken a deep-dive into the technology part of SharePoint, however I can understand the great business opportunities for the Microsoft Ecosystem that are supported with some impressive financial numbers. It is really a no brainer to see how Microsoft invests in new developments that drive the IT ecosystem and indirectly become the driver of economic growth, like you could see Steve Ballmer back-up with hard numbers during the TechNet_Live keynote. Finally I don’t visit the headquarters of Microsoft Netherlands that often, so it was great to be there, experience the corporate culture, and most important I have met some awesome, creative and committed employees from different parts of the Microsoft organization. 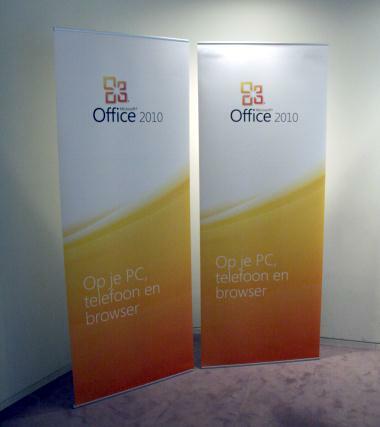 I would like to thank Microsoft Netherlands for inviting me to the Microsoft Office 2010 and SharePoint 2010 launch event. Hey!, I found this information for you: "Microsoft Office 2010 + SharePoint 2010 Launch Event – The Future of Productivity". Here is the website link: https://www.remo-knops.com/2135/microsoft-office-2010-sharepoint-2010-launch-event-the-future-of-productivity/. Thank you.